It’s something you won’t want to miss! 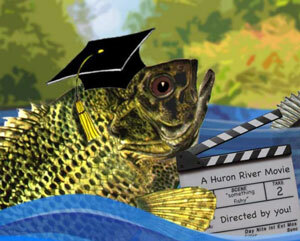 Dan Nienhuis reeled in the Millie for best PSA in 2007 with this clever fellow in "Fish School." The Millers Creek Film Festival will be held on Friday, March 19, 4:30-6pm at the Michigan Theater in Ann Arbor. Watch this year’s entries on the big screen in the Michigan’s main theater, and celebrate the winning filmmakers at a post-screening cookie reception in the lobby. We’ll present “Millies” (our very own version of the Oscars) to the best short films and public service announcements. And HRWC staff will be on hand with information about the Huron River.